9 stage-directors from different companies throughout the different neighborhoods of the metropole Abidjan worked together with 14 actors on a scene from Les Recluses (2010) by Koffi Kwahulé. Together with the young actors of the company of Philippe Irie. Jeanne Tessia is to the right, but she does not belong to this company. 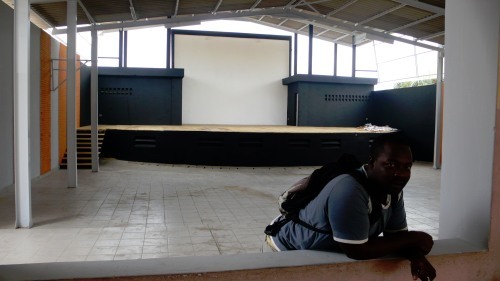 The newly constructed theatre of the CNAC with actor Souleymane Sow. The aim of the workshop was to stimulate the stage directors to develop their own styles in direction. In order to achieve this, it's imperative to dare, to take risks, to avoid existing models, to ask new questions. Most of the stage directors succeeded in staging the complicated fragment from this piece in an interesting way. My accompaniment focused on defying the stage directors to go even further, avoiding easy solutions, and generally the stage-directors engaged themselves fully on this quest. There were participants who had just started out as directors but there were also very experienced stage-directors that participated on this workshop. Same thing applies for the actors: The very popular actress Jeanne Tessia (wwwjeannetessia.com) took the role of my guide and chauffeur and she made me laugh all the time making jokes and teasing innocent bystanders.